Fly to Cape Town on various airlines from €387 return! Air France – cheap return flights to Brazil from Germany for €421! Emirates promo sale 2019 get up to 30% discount on selected flights! Various airlines offer some reasonably priced deals from main European airports to Cape Town so we have decided to sum up the most interesting offers in one post. Surrounded by beautiful Table Mountain, the blend of two oceans and thriving natural landscape Cape Town is usually listed among one of the worlds most beautiful cities. Based on promotions of Air France/KLM (SkyTeam) or Turkish Airlines and Ethiopian Airlines (Star Alliance) you can book cheap return flights Europe to Cape Town already for €387! All of our options are for roundtrip inclusive of all taxes, onboard meals and checked luggage. You will find the cheapest flights from Scandinavia, Paris, Porto, Brussels or Vienna. Also adding some great deals from Budapest, Dublin, Madrid, Baltics, Italy or Germany. Travel dates and other conditions vary by each of the airlines..you can compare all the cheapest flights directly at Air France-KLM, Turkish Airlines or Ethiopian Airlines. Each of the airlines have different conditions of their promotion but in general you will find the cheapest flights when traveling from second half of April to June or September to November 2019. Need affordable accommodation in Cape Town we recommend service of leading hotel booking sites such as Hotels.com or Booking.com. 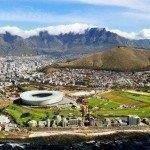 Booking sample of Fly to Cape Town on various airlines from €387 return! The cheapest solution is based on discount of Air France and KLM. You would depart from Oslo to Cape Town on Saturday, 18th of May. Inbound flight from Republic of South Africa back to Europe on Sunday, 2nd of June 2019.